It was late afternoon on the 27th of October 2014, when the tour bus picked me at the Sails in the Desert Hotel bound for Uluru – Kata Tjuta National Park. 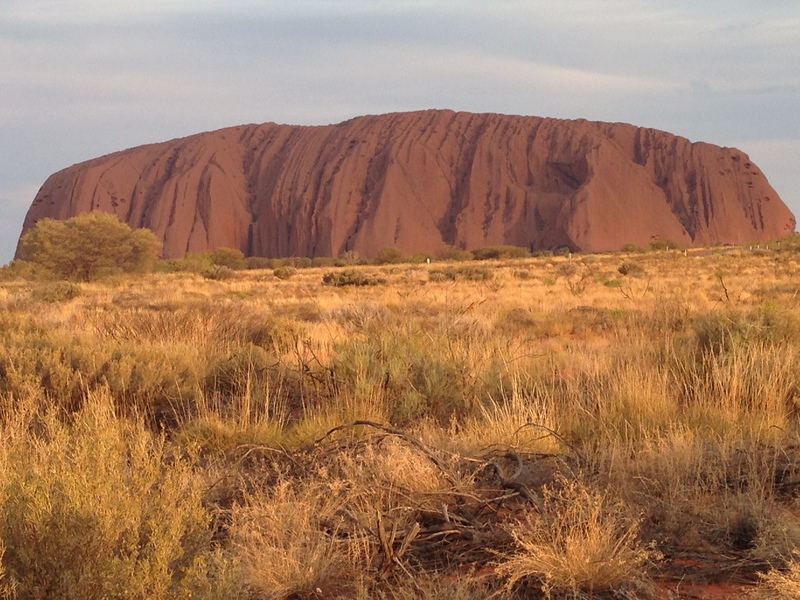 Uluru, also known as Ayer’s Rock, is a sacred site and one of the most iconic sights of Australia. Everything I had read suggested that viewing the rock at sunset and, if possible, at sunrise, is a show put on my Mother Nature that should not be missed. The driver/guide announced to the passengers that he was also a photographer so upon arrival at the viewing area, I asked him if he was going to sell us a DVD of photographs. He said no but that he would be happy to take photos using my camera. I was forced to admit that I had misplaced my camera. He suggested that he could take photos using my phone. I told him my phone was dead and it doesn’t take pictures even when the battery is fully charged. I am sure he was wondering what sort of person arrives at the most photographed monolith in the world without any means of taking a photo. At that moment, up stepped a handsome, strapping, young fellow who volunteered to share his photos with me if I gave him my email address. I have said it before but it is worth repeating – I am the luckiest girl in the world 🙂 I introduced myself and he told me his name was Trigger. I looked puzzled and asked, “Trigger, like Roy Roger’s horse?” He laughed and told me it was a rugby nickname that had stuck. I was relieved to learn that his parents had named him Paul, not Trigger. Interestingly, he was also in Australia for a friend’s wedding. Trig and I talked, and took photos; drank, and nibbled on cheese and crackers. We were joined by a British couple and the four of us chatted and watched as Uluru changed from brown to orange, and finally, to black. I bid them goodbye and boarded the bus heading to the Aussie Barbecue Dinner under the Stars. I ended up sitting with a couple of couples from Canada. If I hadn’t already had plenty to drink, I might have kept my mouth shut. Instead, I announced that I had come halfway around the world to sit with them. I ended up talking so much that I didn’t get any salad – just meat! I had steak, kangaroo, lamb sausage, chicken skewers, and lots and lots of sparkling wine. On Monday, the 27th of October 2014, at 7:15 AM, I boarded the JetStar flight bound for Ayer’s Rock. To my surprise, there is no town of Ayer’s Rock. It is a resort with an airport (AYQ), three hotels, serviced apartments, and a campground. The resort also has a shopping centre with a bank, a post office, and an IGA grocery store, as well as, restaurants, gift shops, art galleries and a travel agency. Free coaches take you from the airport to the resort. A woman with a clipboard asked me where I was staying so she could direct me to the correct coach. She looked a bit puzzled when I told her I didn’t know yet. I still thought this was a town and trusted that I would be able to find a room/tent/bench for one night. At the first hotel, I was told that they were fully booked so, I asked the front desk staff to check with the other hotels. She told me there was availability at the Sails in the Desert (the posh one). This is what I get for not having arranged accommodation before I booked my flight. The room was $400 AUD for the night but by signing up to be an ACCOR frequent guest, I got a discount. If you have just picked yourself up off the floor, bear in mind that I had only paid approximately $100 AUD for accommodation up until this point, so I was averaging $100 AUD a night, and this was not a budget/backpacker’s trip. After arranging for my room, I left my suitcase at reception and headed to the shopping centre to book the Sunset Tour & BBQ for that evening, the Sunrise tour for the next morning, and transfer to Alice Springs in the afternoon, then, I had lunch consisting of Caesar salad and a jug of sangria at the Gecko Cafe. 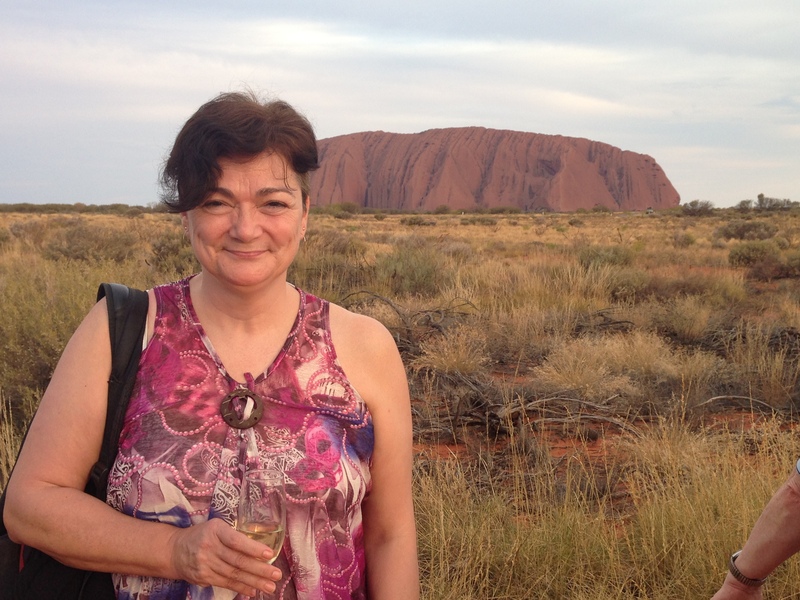 In spite of a slightly bumpy start, my long awaited trip to see Uluru was underway.